Shopping for solar can be a cumbersome process when you are bombarded with a lot of information from the internet resulting in difficultly in drawing conclusions regarding what solar brands, what solar installer, competitive solar panel prices and so on. That’s why online solar tools are useful to help solar consumers make their shopping research process a lot quicker and simpler. With so many solar brands and companies to select from, online solar tools provide a simplified way to help you make the decision to select your best solar company as well as your best solar panels from good reliable sources of information. Most solar consumers are usually concerned about the cost of going solar and the savings that can be realized in the lifespan of solar panels. However, online solar marketplaces are able to go deeper to provide you with the solar energy data that is site specific through application of high-resolution topographical data called LIDAR (Light Detection and Ranging). Through the use of LIDAR, a homeowner or a business owner is provided with site specific weather data as well as shading from nearby structure and trees to precisely give how much solar energy can be produced from their roof. Also, since the selection of a good solar contractor is vital, online solar tools have a pool of pre-screened solar installers for solar consumers to select their best installer. In this regard, solar installers presented to a consumer will include qualified and licensed who are already prescreened by online solar marketplaces. Furthermore, consumers are provided with various financing options including cash, loan, solar power purchase agreement (SPPA) and solar leasing. Financing will also come from different providers for consumers to select different rates when one decides to apply for a loan or enter into a power purchase agreement with the solar provider. To get started EnergySage and Pick My Solar will guide you through this process at your own pace. EnergySage and Pick My Solar online marketplaces apply LIDAR technology to provide users with better solar energy data estimates. 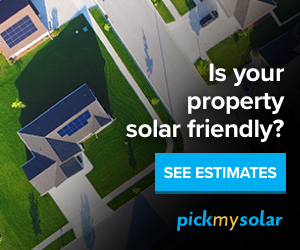 To learn more about online solar tools and find out: Are solar panels worth it? click HERE.